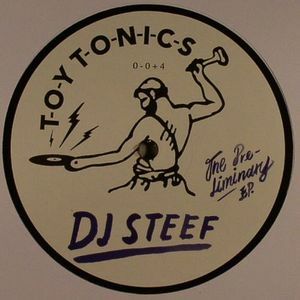 DJ STEEF The Preliminary EP vinyl at Juno Records. 1. "Angels Behind The Bar"
Forging his craft on a penchant for re-edits, Fred Berthet has issued forth a healthy amount of discoid funk in a short space of time since first appearing on Superbreak. Now he has been snapped up by Toy Tonics to deliver this four track EP which is packed full of craftily deployed house groove with plenty of classic reference points, not least the unmistakable 20th Century Steel Band lick on "Venusian Missing". "Angels Behind The Bar" is particularly sharp with its rich spread of samples and engrossing synth stabs creating a neon-lit fantasy around a crisp drum arrangement.